In July 2011, Alia, a founder of what is now a social business called Dreamdelion, started a research project in one of biggest slums in Indonesia, Manggarai. Manggarai is known as an overcrowded slum far from the liveable area located in central Jakarta, although people can easily find symbols of luxury nearby. It's quite terrible sometimes when you try to think deeply about this juxtaposition, and it's also one of best parts of this story that led to Alia's research project to become something much more. In Mangagari slums, there are a lot of children, and many don't receive a proper education, either formally or informally. Perhaps most important, however, is that they didn't get a decent early childhood education, especially in character building. Many of their parents are low-paid workers, and for some, it's even worse as they are not permanent workers. This eventually affects their quality of life, including quality of their children's education. In Alia's research, when the children were asked, "What's your dream?" some of them said without hesitation that they want to be like their parents. No one had a dream to be a doctor, pilot, engineer, and so on. If one of them said that he wanted to be a doctor, all of his friends immediately made fun of him, because they think it's impossible for them to be such professions. They have no big dreams, and often they lose their future before they even do anything. The big question then, is who will take responsibility to help build their future into something brighter? 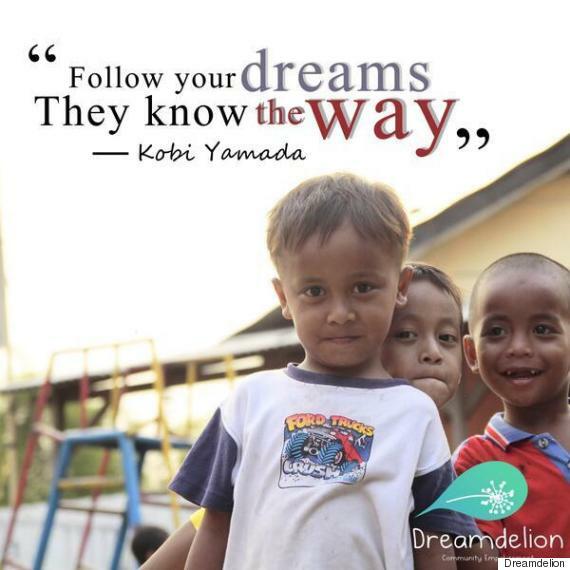 The story of Dreamdelion started when a child asked Alia to continue her research project, called "Sanggarai." Sanggarai, a program intended to empower and educate people in slum areas, was held once a week, and in the beginning, they had classes of 10 to 15 children. Sanggarai didn't simply teach about reading, writing, and other skills, but also about character-building. The child who asked that Sanggarai be continued said that he really enjoyed and loved the project: he and his friends could express anything without being scolded. That little boy's statement inspired Alia to continue, despite struggling with money and human capital, and after several weeks, they decided to carry forth the project with limited resources. One of sessions in Sanggarai required children to visualize their dream. For example, if they want to be an architect, they would bring equipment like an architect such as ruler, pencil, etc. If they didn't have one, they were encouraged to find one. Then after joining session, they started to think what they really wanted to be in the future, and they also began to save up money for their future studies. It may seem a modest thing, but it's an important step to start. In Indonesia, there are big questions to be resolved surrounding early childhood education. Projects like Sanggarai are a great start, but only have momentary impact. To reach scale, Dreamdelion tried its chances entering the Hult Prize competition. As the world's largest student movement for social good, the Hult Prize aims to identify and launch the most compelling social business ideas, that tackle some of the world's toughest challenges, and offers USD $1million in seed capital to the winning team. This past year, the Hult Prize started the "Hult Prize @" program, which invited students from around the world to host a quarterfinal round of the Hult Prize competition on their local campus. Selected to be a campus director of Universitas Indonesia (UI), I was able to work with Alia, her team, and many other inspiring students. Joining Hult Prize @ program as campus director is one of my greatest leadership experiences that I've ever had, not only because the Hult Prize is a well-known competition, but also I learned many insights from the participants and was amazed with their ideas. This year's Hult Prize challenge is about early childhood education, and we had great participation on campus: more than seventy ideas submitted. I appreciated all their work and huge enthusiasm to be part of the change. After two stages of rigorous selection, Dreamdelion came out as winner of Hult Prize at Universitas Indonesia. Dreamdelion had begun their journey long before this year's competition. They went to Manggari almost every week to observe the specific problems, and had time to understand where their intervention could take place. They did a social mapping, and met with the community and local government to get more information, insight, and gain support. The time that they spent during that period is the investment which benefits them today. Despite the challenges and obstacles that all social businesses face, they are providing an important opportunity for Indonesian children to dream.